This week, Tod continues to build out his technical illustration that he started last week. He covers several options for ballooning the illustration, and then outputs the view to line art format. Have you ever spent hours to create a complicated exploded view, with thrust lines and callouts, only to have to re-do it when engineering makes a change on you? creates convenient hot keys to further increase the pace of his work. Le rendez-vous incontournable des acteurs de l’Ã©conomie et de la politique. Lâ€™Ã©mission propose des interviews sans concession dâ€™hommes et de femmes qui font la Une de lâ€™actualitÃ©. Ã‰couter les Sagas du Pouvoir, câ€™est aussi prendre le temps de dialoguer avec des invitÃ©s quâ€™ils soient hommes politiques, ou grands patrons. Voici l’enregistrement de l’Ã©mission avec Bernard CharlÃ¨s. Here is yet another in-depth demonstration of a 3DVIA Composer integration to ENOVIA SmarTeam. 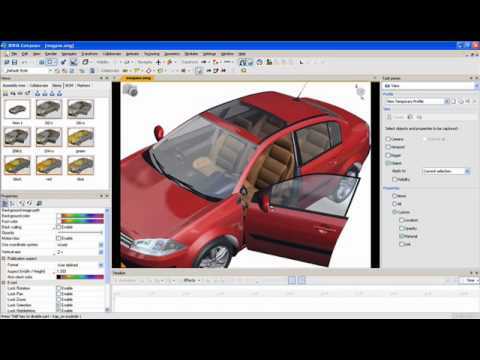 This time you will see 3DVIA Sync Integration, 3DVIA Composer, CATIA, and ENOVIA SmarTeam all comimg together to create a very robust environment for creating, managing, and updating 3D animated content. The example will show how SmarTeam meta data can be integrated into the 3DVIA Composer content, how the 3DVIA Composer file can be managed and updated byÂ SmarTeam, and how CATIA modifications to the product structure can be automatically propagated into 3DVIA Composer. Thanks again to Evgeniy Fedotov for the great sample integration and video. Here is a great sample given to us from Richard Hale of Xype. The effective use of standard icons is prevalent in this example, and is used to ensure efficient information transfer from the author to the consumer of the data. Standardized icons and symbols ensure that the end user has a consistent visual aid to accompany the animated procedure. The icons can also be used as “hotspots” or links to provide an enhanced level of interactivity with the 3D document. Thanks to Richard for sharing this sample and for showcasing how a simple standarization can further enhance the learning curve to add coherence and reliability for all parties involved. If you have ever wanted to simulate fluid flowing through a tube or filling up a bottle, this week’s podcast is a must-see. Tod Cruikshank, one of our 3DVIA Composer AEs, walks us through a couple of very interesting methods to produce a remarkable result. Thanks to Tod for sharing his technique. And many thanks to Sentry Equipment for allowing us to use their data in this podcast. If you have developed an animation trick that you would like to share with us, email me at editor@3dmojo.com and maybe you can be our next guest podcaster! Back in podcast episode #44,Â you saw how easy it was to create complicated motion paths using the simpleÂ technique of combining assembly movements with part movements. Yesterday I was browsing the 3dmojo forum, and I found a very good question posted by 3DComposter (clever and humorous username, by the way!). I thought the answer to this question would make a perfect podcast episode — how you can create a complicated motion path using very simple techniques. Enjoy this podcast episode, and please feel free to continue posting questions to the forum. And if you have created any of your own interesting animation techniques, please feel free to share them with us by posting them directly into our forum under the “Share It” thread. 3DVIA your iPod #68: Dewoitine D520 animated! You may recall the Dewoitine D520 example that Laurent BEAUVAIS had created in 3DVIA Composer. 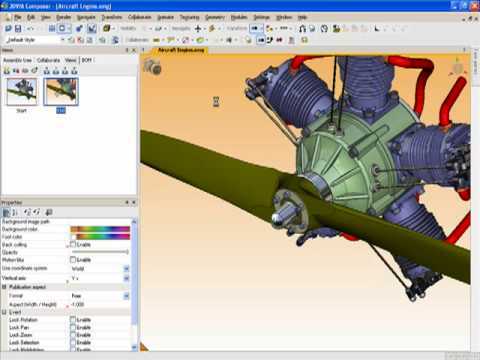 Mr. BEAUVAIS had done a fantastic job of creating all of the views needed to show how to assemble the model plane — and this podcast episode will show you how easy it is to reuse those views and build an animation from them. 3DVIA Composer is all about giving you manyÂ ways to reuse and leverage your content, so that you can get your job done more quickly than ever before. If you have ever wanted to take your 3DVIA Composer file and maximize the performance while reducing file size and maintaining important details, this week’s podcast is a must-see. Watch and learn how in 2 minutes, you can selectively control what components to optimize and what componets to maintain at aÂ high level of detail — all while reducing the file size of the overall model. Now you can not only take advantage of the industry-leading performance of 3DVIA Composer,Â you can even take it a few steps further. This kind of flexibility and control is yet another ofÂ the plethora of amazing capabilities and benefits contained within 3DVIA Composer. Watch this podcast to see how, in 6 minutes, you can use the capabilities of Intelligent Views and Events to create an extremely interactive 3D document. It is yet another example of the elegant power inherent with 3DVIA Composer. Many of you have seen how easy it is to create views with 3DVIA Composer. Watch this podcast episode to learn how to create “intelligent views.” If you have ever wanted to capture only a sub-set of information for a particular view — such as the camera, or a part’s position and color — and then apply that information to another view, you can easily do this with intelligent views. This is yet another great feature of 3DVIA Composer that makes it extremely powerfulÂ and functional,Â yet wonderfully easy to use. We are often asked about whether 3DVIA Composer can be integrated into a PDM or PLM system. The answer, of course, is a resounding “yes”. With the power of 3DVIA Sync Integration and our open XML architecture, our customers have been able to create very robust integrations to their business systems such as Agile, SmarTeam, ENOVIA VPM, and many others. And the best part is thatÂ they were able to complete those integrations very quickly. In this episode, Lou GalloÂ offers his expert opinions and insightsÂ after taking a 3DVIA Composer training class. He discusses what the product does and how it fits into the SolidWorks family of products. He explains why 3DVIA Composer is not a “replacement” to existing tools, but is a wonderful compliment to help bridge the gap between CAD tools and documentation layout and publishing tools. Lou also talks about the other modules of 3DVIA Composer, and highlights some examples and use cases as to when you would need to use them and what value they will bring. This week, Christophe Delfino demonstrates a new capability that was released with 3DVIA Composer V6R1. If you have ever wanted the ability to control the rendering mode on a per-part basis, we were listening.Â With “custom rendering” mode in V6R1,Â you can now create views thatÂ mix some parts in silhouette mode and some parts in shaded mode, or anything in between. Watch Christophe select parts, create content, and adjust the rendering displays of that content in under 90 seconds. It is yet another impressive and extremely usable functionality of 3DVIA Composer designed to further improve clarity and communication, and demonstrates our continued commitment to provide customer-requested enhancements. This week I bring to you a special Monday podcast: our brand new 3DVIA Composer brochure. This version has been optimized for electronic distribution. High-resolution printed copies will be available soon. In a previous podcast, you watched Jonathan use 3DVIA Sync to automatically update his product deliverables. It is a very powerful demonstration, and I encourage you to watch it again. This week, you will see a similar demonstration, but with a very key difference: all of the CAD conversion and publishing to 2D formats is done using 3DVIA Sync Integration. Using scripting and XML job file definitions, 3DVIA Sync Integration offers a powerful way to equip your PLM systems with the ability to automatically trigger the creation of 3DVIA Composer files and publish them into several deliverable formats. You’ve heard us rant about the exceptional qualities of 3DVIA Composer, and how we make better reuse of CAD data than other competitive products such as Isodraw. I’ve shown 3DVIA Composer to people hundreds of times, and I never grow tired of the look of amazement on peoples’ faces when they see what we can do.Â But what really amazes me is how quickly our customers can go from purchasing our product to being productive and generating positive returns: it’s a tribute to our architecture and ease of use. It’s why we win benchmark after benchmark, why customers continually choose 3DVIA Composer over other products, and why customers actually turn off those products in favor of 3DVIA Composer. In Episode #54, Jonathan introduced 3DVIA Safe, and demonstrated how Secure 3D can be used to protect your intellectual property from reverse engineering. This week’s podcast shows another capability of 3DVIA Safe: “Right Manager”. Right Manager enables 3DVIA Composer authors to enable or disable certain functions in the 3DVIA Player. In any video program — podcast or network television — there’s occasionally a “can’t miss” episode. Number 57 — this episode — isÂ one of thoseÂ must see episodes. In justÂ about five minutes, this episode really puts it all together for you. Watch it over and over again to see the subtleties of what is going on and you’ll get the fullÂ understanding ofÂ what we mean by product information everyware. This week, I am putting a new data sheet for 3DVIA Composer into the podcast feed instead of our usual video “vignette”. I wanted to make sure everyone has an opportunity to see it, as it contains the first screenshots we have published with the 3DVIA Composer UI. Past PDFs we have put into the podcast feed have been extremely popular. The blog and podcast will return in early 2008. Until then, everyone at 3DVIA wishes you and yours aÂ happy holiday season. This week, Jonathan gives us a compelling overview of 3DVIA Safe, technology that is part of 3DVIA Composer which absolutely, positively guarantees that users of 3DVIA Composer-generated data will not be able to copy it and abuse your design’s intellectual property. Think about it for a moment: if we are really moving to an era in which 3D information becomes as commonplace as text, how are we going to secure this information? If everyone has 3D product data, how do we protect our digital product definition? After all, digital product data today is the product in many respects. 3DVIA Composer’s answer is thatÂ you do it in a way that encourages the use of the data but which makes it impossible for those uses to be diverted in ways that endanger the digital definition. I am very pleased to be able to bring yet another video episode to you today. You may notice that while the name of the podcast has changed to reflect our new branding, the actual video was recorded by Jonathan using the product formerly known as Seemage. (Prince fans, please forgive me.) That’s because we prepare these episodes in advance of their publication. WithÂ our hectic schedules,Â the podcast contributors record episodesÂ when theyÂ can, and I select the order in which we present them. The content is so good and has been so popular that I think it’s better to share episodes recorded before we shipped 3DVIA Composer than to waste these fascinating looks at the capabilities 3DVIA Composer offers.